StinkySocks Hockey leagues are designed to provide you with the hockey experience that you’ve been looking for. Quality, value, consistency, structure, and integrity are the principles that StinkySocks Hockey leagues are built on. This is hockey, redefined. Our Open League Season Passes are our traditional format, designed for individual and small group registration. A Season Pass is your ticket to a series of structured/organized games that are focused on getting you on the ice get a great workout playing the game you love. Benches are limited to 10 skaters to maximize the amount of time that you’re on the ice. All players qualify for Full Time/Season Pass member benefits that include the ability to transfer to another game when you can’t make one that’s part of your Season Pass. BYOT Leagues allow captains to bring and manage their own team while not having to worry about administration headaches. Although the structure is more serious, you can expect players who are there to have a seriously good time. We’re dentists, firefighters, doctors, businesspeople, policemen, lawyers, electricians, and teachers, to name a few. As StinkySocks Hockey players, we love the game of hockey, enjoy friendly competition, and look forward to a great game, every game. We are an inclusive community with respect for one another. We don’t want the nonsense often found in other leagues (fights, dirty play, disrespect, etc). In short, there are “no jerks” at StinkySocks Hockey. Read more in Who We Are. No B players in the D league, no C teams in the B league; it’s just one of the many things that makes StinkySocks Hockey different from other New England area hockey leagues. This principle value is part of what we do to put you, the player, first. Visit the levels page to learn more about how levels are defined by StinkySocks Hockey. 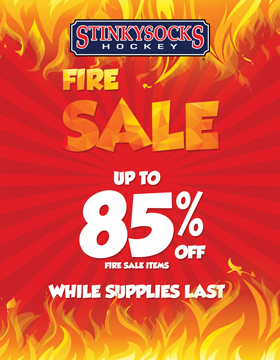 As a StinkySocks Hockey Full Time member, you’ll have access to exclusive benefits. This includes discounts like 10% off NCH games, skills clinics, and apparel, access our private stash of Bruins tickets to get to the Garden for less, the ability to go standby for any game and play for only $10 if there’s room, free skate sharpening, and more! You can even get a waived initiation fee for our Unlimited Membership to get unlimited hockey for one low monthly cost and bring someone who hasn’t tried StinkySocks Hockey before with you to skate with you for FREE, once per month. Can’t make a game? Change it! Full Time League Members can change into a Hot List game for free, or apply a $10 credit to any other game, that’s available at the time of callout. That applies to any of their games, NCH or league, when calling out in advance of the game. Have a look at our member benefits comparison for more info. Are you looking for the hockey experience that you see here? If you’re a right fit then we make it easy for team captains to transition to the StinkySocks Hockey league. Have a look at our info for teams/groups to get started.